Most of the textual contents of this website are stored in a version control system that is hosted by GitHub in here. The system maintains change history, list of contributors and other things. You can get started with GitHub by reading their guides. GitHub offers two ways to download the contents of the version repository. Click the button that reads "Clone or download". You can download it as a ZIP file. If you are used to programming, you can clone the repository with Git. In this case you can create a pull request in GitHub. Contents of Pandunia website is written in plain-text using Markdown format. Markdown is a light-weight and easy-to-use syntax that is perfectly readable in plain-text. Read description of the Markdown syntax here or here. Pandunia website uses Markdown-based content management system called Up for displaying the contents. You don't need to install it locally. Instead you can use MDwiki. Just copy mdwiki.html to the same folder where pandunia texts are (index.md, navigation.md and the rest), double-click mdwiki.html to open it in your browser and you're ready! English version is the original version of the site. Translate to your language from the English version if possible! Otherwise use another language that is up-to-date and complete. When you begin translating for a new language, start from these files. This page should include a short introduction to Pandunia. Include here links only to pages that are existing and/or ready. Keep the original name! 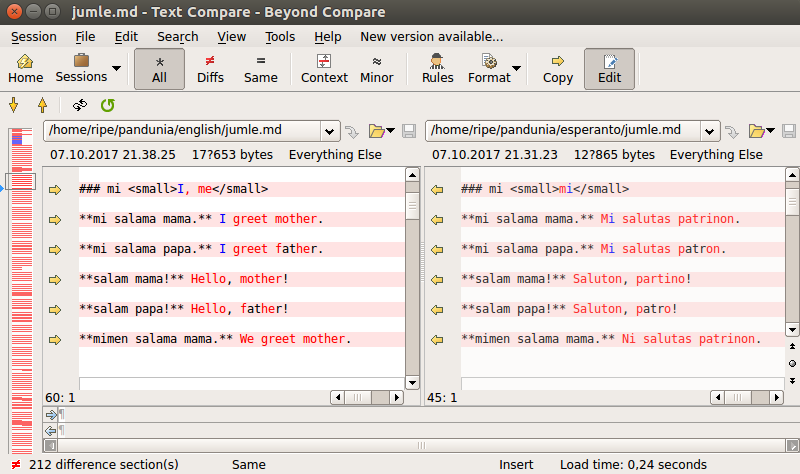 Names are in Pandunia so that contents of different language versions can be compared more easily. The best way to update translations and to translate parts of documents is to use a program that compares two files side by side. A good tool for this is BeyondCompare. Pandunia words and sentences should be the same in both language versions, so they function as anchor points that keep the versions in the same line. Readers can be all ages and they can have any level of education. Certain languages are read by many non-native speakers too. Use original examples in Pandunia. This way it's easy to compare versions. If something sounds bad in your language when it is translated from English (or another language), just change it to something better! You can improve also the source text. The source text is not perfect. There can be unclear things, improper style and even mistakes.